Acharya Vikrmaditya is a trainer, counselor and spiritual guide. His life had been devoted to the study of ancient Indian mystic science where he is evidently at home. Under the spiritual guidance of His Divine Grace Acharya Keshav Dev he spent years studying and practicing the sciences of yoga, meditation, Tantra, Kundalini, Mantra, Ayurveda, Astrology etc. he has thorough acquaintance of modern subject like rebirth, telepathy, hypnosis/trance, paranormal also. Acharya Vikrmaditya has done Master in yoga and is Acharya in astrology. He is an expert in the science of mudra, remains committed to the preservation and popularization of this spiritual heritage. Acharya Vikrmaditya holds regular workshops on the subjects of mudra, yoga and meditation/ meditational techniques. As he himself says the sole aim of his worships is to help those in ignorance and distress with this wonderful gift of God. In these workshops you will also find the scientific rationale behind these esoteric sciences explained to you by him. Workshops conducted by Acharya ji cover subjects like Yoga Mudra, Swar Vigyan, Hath Yoga and Asanas, Ayurveda and practical guidance on different system of meditations. Hands can heal - literally ! There is a miraculous power hidden in our hands that can heal seemingly incurable diseases and connect us to the authentic consciousness that is our essence. Everything in existence owes its genesis to energy. Our traditional philosophy too sees every thing as ‘Chaitnya”. The findings of modern science state energy as the fertile ground from which every thing has sprung. Actually this chaitnya or energy is the over alive spiritual substratum which is creating, sustaining and dissolving phenomenal world. This secret lived on with the esoteric masters shielded from common masses and found expression in only their spiritual endeavours discourses. The puritan approach also blocked these secrets from reaching us which could have been used to alleviate man’s suffering. Today as the spiritual search deepens under the impact of materialism more and more new secrets find their way to us. Yoga stands tallest among such revelations. Modern man is more diseased and depressed than he had ever been. Constitutional factors apart a great number of them are resulting from pollution, unhealthy habits and stress of modern day living. This is putting him at great disadvantage. A man under the spell of illness lives disconnected from himself. On the other hand a person who experiences his inner vitality and clarity of mind, experiences joys of life and is a source of positivity for others too. How the sick too can achieve this state? As changing the myriad of outside factors remains beyond scope the best approach would be to fortify ourselves - to strike at the fount of bliss and vitality that lies in our very being. Mudras as Gurudev presents them to you are a key to this. 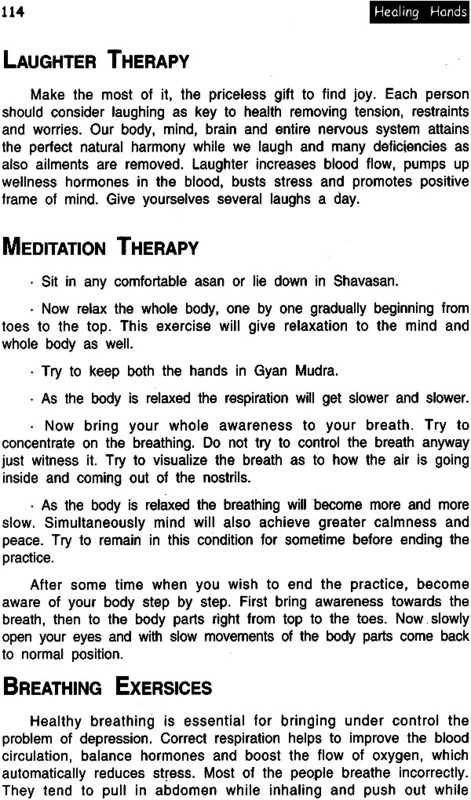 Mudra vigyan is a specialized branch of yoga. The subject remains hitherto little explored because there were no fuller scriptural references and it largely survived in secrecy. Still this vedic subject was adopted well by the Buddhists as the extensive coverage given to it in Tibetan scriptures show. Yoga constitutes our civilisational heritage and the scientific developments in all ages have only authenticated its depth, originality and completeness. The variety and extent of phenomenal world defies logic. Even after summoning our all powers we would succeed in unraveling it but a little. How yogis claim of knowing it intrinsically then? Because of yoga accords them the primal energy and consciousness which has went into making the subtlest to the grossest. Thus laying it threadbare before them. It approaches the panorama of physicality with the tool of consciousness. Our ancient seers and yogis had discovered the reality of this body where the bone and flesh were the husk over this imperishable energy body. An illness thus primarily revealed an energy mal-functioning requiring adjustment. A lot many concepts appear gaining ground in our time as far as healing is concerned. They all however agree on the basic premise that healing is not something to be imposed from outside and body should be allowed to find its inner healing response - our work being limited to helping it achieve this end. The best approach thus seems to redeem the body to its own corrective energies. None accomplishes this better than yoga and especially Yoga Mudras. Modern science has started accepting the role energy fields play in the life of living things. In an interesting research in the auric scan of a yellowing leaf showed the accompanying energy field absent while in the case of a growing plant the energy outline of leaf was present even before it had appeared. As body is a complete system the corrective energies too must be present inside itself - it is reasoned. In yogic parlance the body lives by its own imperishable prana upon whose leaving body doesn’t survive on external energy. According to Yoga tatva mudra vigyan (Yoga of elements) the five constituents of this physical body are fire, air, ether, earth and water represented by our thumb, fore-finger, middle finger, ring finger and little finger. There is a tremendous flow of energy from our fingers. When we assume a particular mudra a subtle but very highly powerful elemental interaction starts inside reversing the defective state. And once the optimum balance is reached, it stops of its own accord. We will have to accept unless the defective and ebbing energies of body are corrected/optimized administering drugs from outside can’t be much help. As per yoga a live grid of intelligent energy underlies this physical frame. Auric is said to be an attribute of this same energy called prana. This prana alone is the ultimate healer. The saying “Doctor dresses the wound, God heals it” indicates to the same thing. 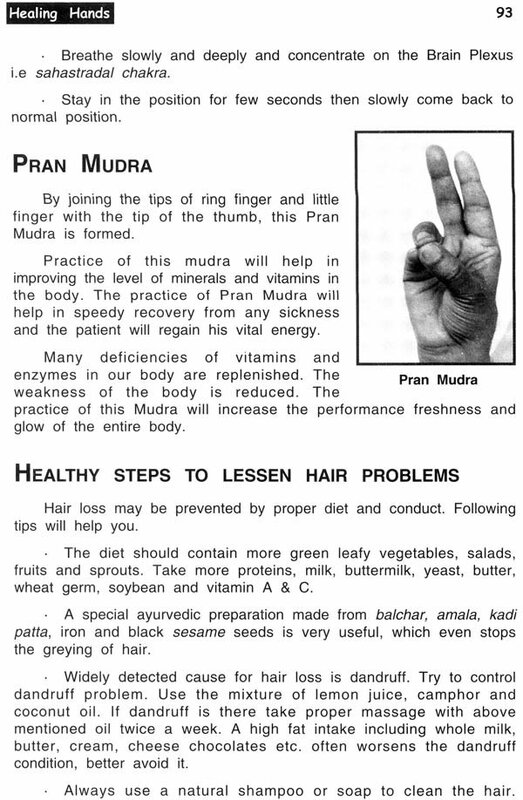 Mudra healings work at most harmless pace and are absolutely without any side-effects. 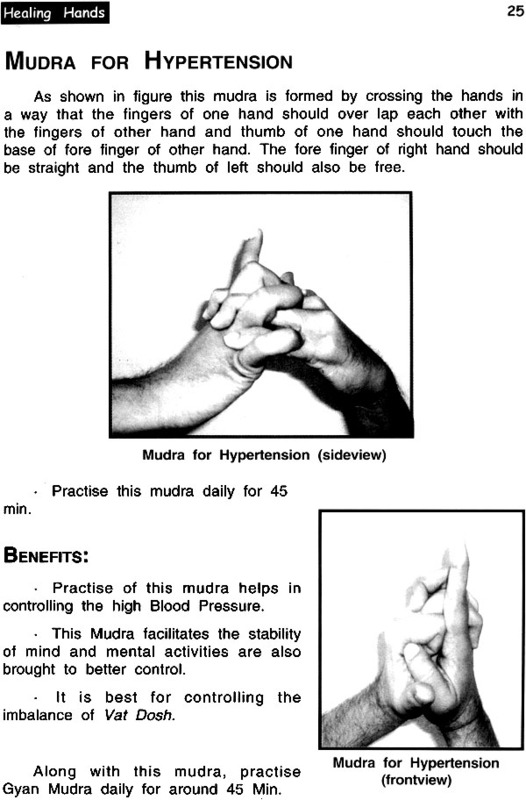 The gift of mudras are two fold-they restore optimal health and enhance our mental and spiritual powers. With practice increased awareness, bliss and concentration all start adding one by one, however this remains for the individual as to with what objective he wants to do it. A vibrant health though is sure to come to all who practice it. The Vivekananda Yogashram Hospital had been engaged in scientific research on therapeutic effects of Mudras for the last few decades and the results have been highly optimistic. It gives inexpensive, rapid healing, completely free from side effects, which young, old, healthy, sick all can easily follow. The hospital uses integrative approach referring to allopathy, yoga and naturopathy as the condition demands. As His Divine Grace Acharya Keshav dev ji also says the wellbeing of patient is paramount. 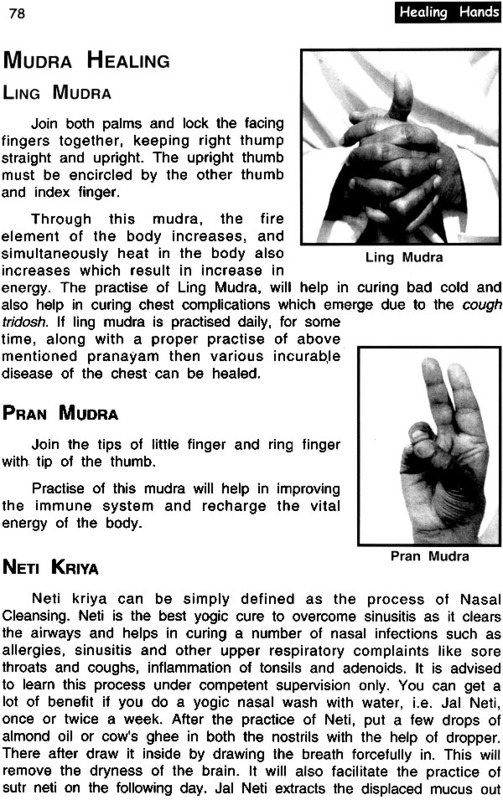 The diseases have been dealt chapterswise and after their brief detail each one’s miraculous cure is explained alongwith how to use mudra therapy to achieve it. 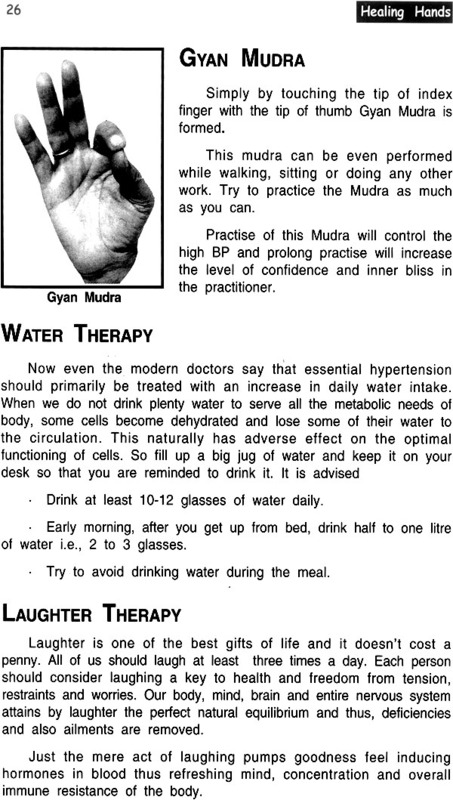 The chapter dealing with high blood pressure and heart disease explains the various causative lifestyle factors and suggests both mudra therapy and needed change in habits. Hormonal dysfunction induced diseases like thyroiditis and skin allergies have been explained in detail along with remedies since common masses have little knowledge about these disease. Medical conditions like Urticaria and irregular menses have been comprehensively dealt in respective chapters. It lays down the dietary modifications also that should ideally accompany it. Other chapters take up such diverse conditions as sleep disorders, sinusitis, hair problems, vision anomalies etc. the chapter on migraine deeply explains the underlying causes along with yogic management of the disease. The diseases of cervical and spondylitis had been given extensive coverage since their occurrence is quite pronounced. It is spaced over seven chapters. Spine is verily the backbone of our health. Sedentary lifestyle, poor posture and toxic accumulations in body are some of the common factors causing it. If ignored in initial stages they take really troublesome form often incapacitating the patient. 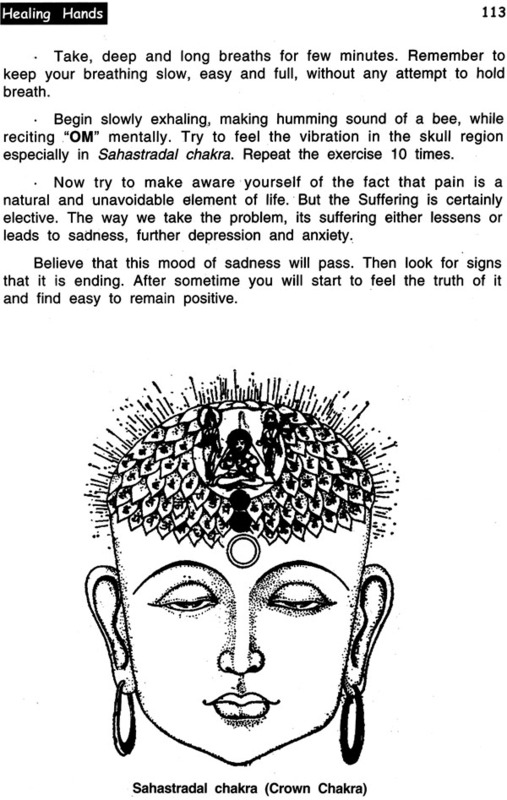 An effort is made here to give comprehensive remedy in the form of Sapt chakra asanas - a series of seven asanas dealing with chakras, invented by His Divine Grace Acharya Keshav Dev which addresses the disease at the pranic level and brings miraculous cure. The movements are very simple and no way bring strain on the body. Supple spine is the key to overall good health, insists Acharya ji. The kriyas take only seven minutes. However the patient is advised to consult before beginning them. Proper dietary adjustments too have been recommended. The importance of memory can be hardly overstressed. A good memory is in fact indispensable. A lot of people these days report of falling memory, poor retention and related symptoms - which mostly are the effects of stress. Gyan Mudra will work wonders in this case. It will not only arrest the process but would yield even better than earlier memory. The chapter also suggests lifestyle modifications for lasting cure. In the case of psychological disturbances it acts as a panacea restoring positive disposition where allopathy affords only symptomatic relief. 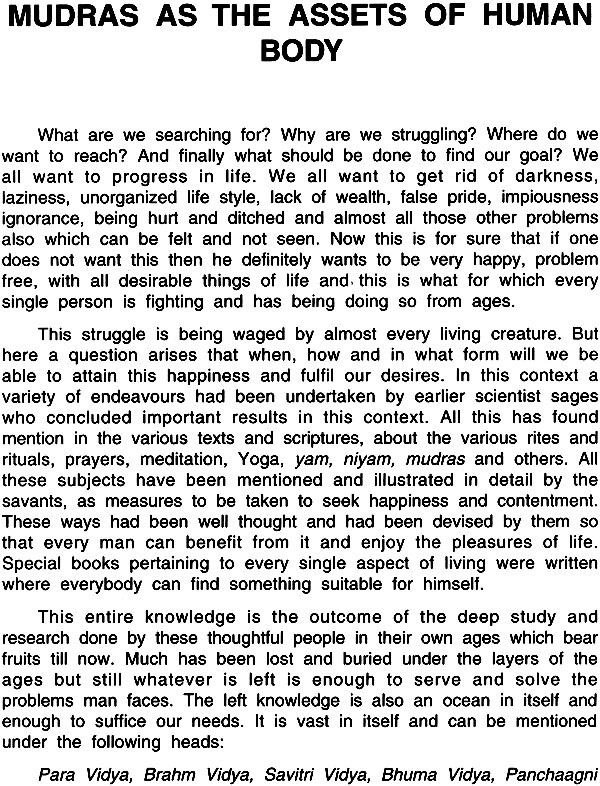 The concluding chapters of book have been devoted to such questions of everybody’s interest as how to attract fortune and become rich etc. Acharya ji goes on to stress that mantras have the occult power to attract prosperity if done in the spirit of ernest faith and devotion. Beautiful Rig Vedic verses of propitiating Goddess Lakshmi accompany it. We remain grateful to Acharya ji for placing in our hands this gem of yoga. His Divine Grace Acharya Keshav Dev ji’s life has been devoted to ceaseless exploration of our yogic heritage and the related sciences. He is considered foremost authority n yoga mudras. Acharya Vikramaditya too is well-versed in the subject and besides writing appears frequently in programs devoted to esoteric. Much work is underway to explore and more fully bring the miracle of yoga mudras to the masses. 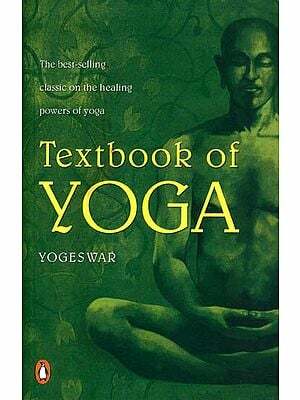 The case compilations and research carried by the yogashram shall provide ideal ground for further examination. In the best interest of patient an integrated approach is envisioned here where allopathy, ayurveda and yoga all contribute on expedient basis. Work is also continuing on diseases like Cancer, Parkinson, Varicose veins, Gall bladder stones and the researches are confident of braking fresh ground. But the most important factor is ‘you’ in whose hands now we place this inestimable gift of nature - use it to escape your suffering and reach the gates of health and bliss. May you be healed! Human body is the supreme machine of the nature, and much more advanced than any modern super computer. According to Gurudev His Divine Grace Acharya Keshav Dev Ji Maharaj this human body is complete and miraculous in itself and the marvelous creation of the nature. According to the Indian Medical science and our seers and sages, the whole universe is composed of five elements and even the human body is also a composition of the same five elements. And nature has given five fingers in the hands of human body to represent the five elements, no doubt some people have more than five fingers in their hand, but clearly saying that extra finger is of no use. To govern this supreme machine of the nature, our learned seers and sages rishis and tapaisvis after deep research and analyses had discovered Yoga Tatva Mudra Vigyan (Science of Gestures). And these gestures act like remote control to govern this miraculous human body very minutely. Physical ailments are the results of the disturbance in the equilibrium of the five elemental forces of the body. This imbalance can be cured through medicine, mantra vigyan or even through any therapy. But Gurudev says that all these are the external things. We have earlier said that Human Body is complete in itself, then nature must have given or made some thing in this body itself to cure this imbalance of elements. 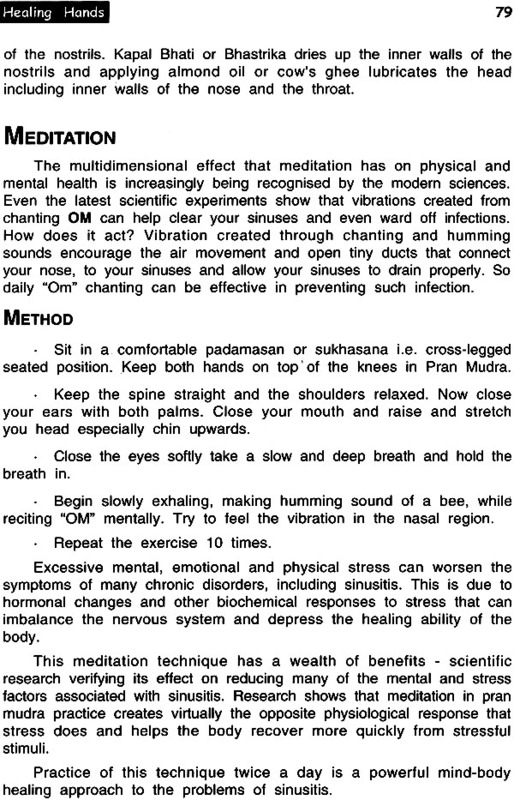 This imbalance of the elements can be easily cured through Science of Mudras. Here, by Mudras we mean the different postures which are formed by crossing and joining of the fingers of one or both the hands. Previously these mudras were used as the rituals for worshipping only. Hs Divine Grace Acharya Keshav Dev Ji Maharaj was the first person in the modern age who discovered and analysed the modern scientific and healing aspect of these Tatav Yog mudras, and presented them before the masses for the betterment of their life. According to Mudra Vigyan, Gurudev says there is tremendous flow of energy in our hands and each finger represents one of the five elements that is Agani (Fire), Vayu (Air), Akash (Ether), Prithivi (Earth) and Jal (Water). Thumb (Angutha) is fire, forefinger (tarjani) is Vayu, Middle finger (Madhyma) is water. The roots of all diseases lie in the imbalance of the five elements and can be corrected with medicines, willpower and mudras. To solve the diagnosing factor Modern science has divided basic elements into 106 elements and even they are trying to divide them further more. Even the diagnosing factor thus has not been solved yet. Similar to the modern science, our rishis and learned scholars of Indian medical science also researched on these five elements. To solve the diagnosing factor they divided these five elements into 24 elements. According to the Maharishi Charak in his renowned book of Ayurved, Charak Sanghita, in first chapter it has been stated that the human body is of composed of 24 elements. And after that these number of elements were reduced to Seven. You will be surprised to hear that this number of seven has a very important position in the Nature. According to the astrology seven planets, seven colour of rainbow, seven yogic plexuses (Yog Chakra), seven ragas (notes of music), seven seas, seven days in a week and they are same everywhere in the world, seven rounds of fire at the time of marriage in Hindu tradition and likewise various other things. These factors are directly and indirectly related to all the rights and rituals and our ancient culture and shastras. After this, they came back on the five basic elements, as these are only the base of the Nature. There is clear mention of Panch Dev Pujan, Panch Pran Upasana, etc, etc. and after that these number of elements were further reduced to three. i.e. Vath, Pith and Cough. These are known as Tridosh. And presently the whole Ayurvedic science depends upon these three dosh instead to five elements. According to the Anda Pind theory of the Vedas, this human body is a miniature form of this Cosmos. As per this scientific theory, as the outer Universe consists of Sun, Moon, Galaxies, Planets visible or invisible, big or Small stars etc. Similarly every thing, what so ever, is in this cosmos, is present in subtle or minute form in this human body. According to the Tatva Yoga Mudra Vigyan, every thing in this universe is composed of the five elements. And same, is the case with this human body. In the human body, our bones and muscles and composed of the Earth element, blood and other fluids are composed of Water Element, whole vital energy is the fire element, all the working of the human body is due to Air element and above all that inner subtle energy what we call atma (soul) is the Space element. These five elements are also arranged in particular series. As per the Law of Nature, our hand has five fingers, which five fingers represent five elements. As Earth, Water, Fire, Air and Space. In the same way, our ring finger represents Earth element, little finger represents Water, then thumb represents Fire, index finger represents Air and finally middle finger represents Space element. And you will be surprised to learn that every thing that exists in this cosmos takes birth in the same cycle and even vanishes in the same way. For instance, according to the Vedic Philosophy let’s take the example of the dissolution of our Earth. At the time of Pralaya, it has been said that, this whole Earth, i.e. land will vanish into the Water, and the water will vanish in fire, and fire will vanish in the air, and at last, even this air will vanish is space. Curing Sick and Defective Elements. 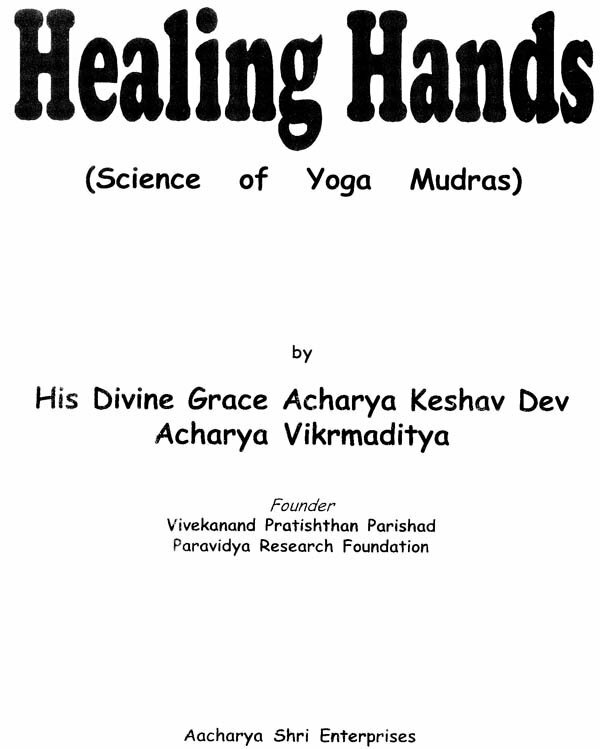 Similar to any other therapy, Science of Mudras can also balance any imbalance at the level of element very easily without any external help or medicine. And here I would like to mention one important thing that this cure or remedy will be without any side effect. By joining the forepart (tips) of any finger with the forepart (tip) of the thumb, that particular element starts increasing and as soon as it comes to the balance level it stops charging. What sublimity of function! Similarly, by bending any finger on the base or the pad of the thumb that particular element starts decreasing. There is tremendous flow of energy through our hands. Now a days even, the modern scientists say that there is a flow of energy through our hands, but this was analysed by our seers and sages, long back in ancient times. And not only this they had even analysed this phenomena more minutely. As they said that from each finger of the hand there flows a different Vidhyt Pravaha (Energy). And it can be also proved by the various examples, which are clearly given in the Upnishad, shastras and in our Aryan Literature. For instance, in the Ramcharitmanas by Sant Tulsidas, there is a particular chopai (couplet), which clearly indicates this fact. Je Tarjani Dekhi Mari Jahi. This brings an important fact before us. These lines were said by Laxman to Lord Parshuram, that we are not like the flowers of Sistafal (white pumpkin) which will die just by showing the index Finger. This couplet brings out a very strange aspect and a fact that different kind of energy flows through our index Finger. This is scientific fact that if any body shows the Index finger to the flower of the creeper of the white Pumpkin, then that flower will not fertilise into a fruit. And if you show any other finger other than the Index, there won’t be the same result. This was examined practically by us at our Ashram under the guidance of Gurudev, what we did, we brought two seeds of this creeper and sowed them in separate pots, both were given same treatment, same water and manure, and after some time, when creeper of both pots started flowering what we did was, that we started showing index finger to one creeper’s all the flowers and other creeper was not shown any thing. After some more days all the flowers of the creeper which was shown index finger died and were not converted into fruits. While the other creeper was flowering and producing fruit well. Now we interchanged the process, mean to say we started the other creeper showing the index finger, the results were vise a versa.